On July 23 2008, the High Resolution Stereo Camera on board the ESA’s Mars Express took the highest-resolution full-disc image yet of the surface of the moon Phobos. New observations of Mars' moon Phobos show the object ismore like a pile of rubble than a single solid body. Phobos, the larger of Mars' two moons (Deimos is the other),is anenigmatic satellite: Scientists aren't sure howit formed, or where its material came from. New data from the European Space Agency's MarsExpress spacecraft currently in orbit around the red planet are helping toshed light on the moon's origins. Scientists have created a 3-D map of Phobosfrom high-resolution images taken during Mars Express's summer 2008 flybys ofthe moon, and used this data to calculate its volume. Another team of researchers used radio signals from thespacecraft that vary based on the tug of Phobo's gravity to calculate theobject's precise mass, and found that it weighs 1.072 x 10^16 kg (2.36 x 10^16pounds), or about 1 billionth the mass of the Earth. "We can be ten times more precise in our frequencyshift measurements today" than previous estimates based on data fromearlier satellite missions, said Pascal Rosenblatt of the Royal Observatory ofBelgium, a member of the Mars Express Radio Science team. The mass and volume information allowed researchers toreckon Phobos' density, and the scientists found that the moon is not solid,but probably filled with giant caverns. Researchers call this kind of body,which is basically a clump of rocks held together by gravity, a rubble pile. Phobos' density ? 1.85 grams per cubic centimeter (0.067pounds per cubic inch) ? is lower than the density of Martian surface rocks,which are 2.7 to 3.3 grams per cubic centimeter (0.098 to 0.119 pounds percubic inch). 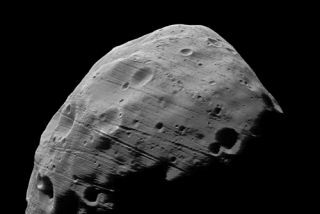 In fact, its density is similar to that of some asteroids,suggesting that Phobos and its sister moon could be captured asteroids, ratherthan satellites created out of material from Mars itself. To get to the bottom of Phobos' origins, samples of the moonmust be brought back to Earth for analysis, scientists say. A Russian missionplanned to launch next year, called Phobos-Grunt(meaning "Phobos-soil"), could do exactly that, and will need MarsExpress's precise measurements of Phobos' mass to land on the moon. Correction: The mass of Phobos has been corrected.